Animal rights advocates said the move to sell the horses put them at risk of being sold to "kill buyers." Federal officials were set to begin rounding up about 1,000 wild horses from land in northern California to be put up for adoption and sale on Wednesday — but some could end up in slaughterhouses, animal advocates warned. 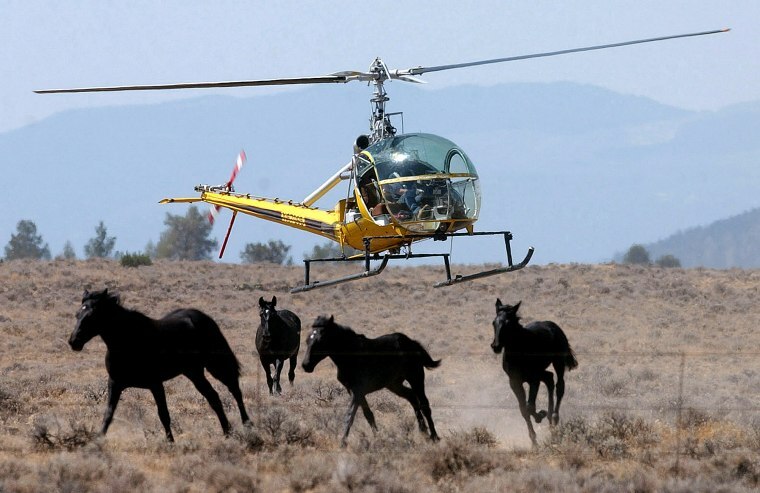 The horses will be taken from the Devil’s Garden Plateau Wild Horse Territory in the Modoc National Forest in Northern California starting Wednesday, according to the U.S. Forest Service, which manages the land. The Forest Service has said the area should have up to about 400 adult wild horses under its management plan, but currently the area has almost 4,000. Animal rights advocates said the move to sell the horses put them at risk of being sold to "kill buyers" who would ship them abroad to slaughter plants to produce horse meat. "There's a risk whenever you sell these horses that you're selling it to someone with nefarious intentions," D.J. Schubert, a wildlife biologist with the advocacy group Animal Welfare Institute, said Tuesday. "That is not an appropriate fate for protected wild horses." Schubert also criticized the tactic of rounding up horse, saying the process can be "quite brutal" on the animals and was shown to actually increase the reproductive rate of the horses that remain. "There's plenty of evidence of horses being severely injured to the point of having to be euthanized as a result of these roundups," he said. He said a more humane way of managing horse populations was through the use of immunocontraception technology that would reduce the reproductive rate in the horses and lead to population decline. “It’s a sad irony that the first federally protected wild horses in decades to be purposefully sold by the government for slaughter will come from California — a state where the cruel practice of horse slaughter has been banned since the 1990s,” Suzanne Roy, executive director of the American Wild Horse Campaign, said in the statement. Younger horses under 10 are more likely to be adopted, the Forest Service said, while horses older than 10 who are not adopted will be put up for sale in November. The American Wild Horse Campaign said the Forest Service will round up about 700 younger mustangs for adoption, but roughly 300 older horses will be made available for sale after 30 days. The Bureau of Land Management, the federal agency that manages the majority of America's wild horses and burros, is prohibited from selling the animals for slaughter, the Forest Service is technically not bound by the same condition. Still, there is nothing requiring the service to make the horses available for sale either, Schubert said. "The law allows it but it doesn't require it, they have the direction to do what's right, to do what's humane." he said.